Is SVG Finally Coming to Internet Explorer? As a part of Microsoft’s continued commitment to interoperability and standards support, yesterday we submitted our request to join the Scalable Vector Graphics (SVG) Working Group of the World Wide Web Consortium (W3C). We’re excited to take part in ensuring future versions of the SVG spec will meet the needs of developers and end users. Web developers have passionately bemoaned IE’s lack of SVG facilities for many years — it’s the only mainstream browser which does not support the image standard. 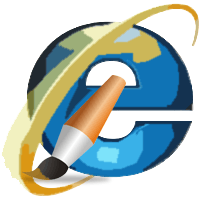 Microsoft may have stopped short of announcing a full SVG implementation in IE9, but the signs are looking good. I always suspected Silverlight to be the main reason why Microsoft avoided SVG. The company want to increase Silverlight’s following and possibly considered the image format to be a competitor. I’m not convinced that’s the case and, even if it were, good SVG support has a greater potential to reduce dependency on Adobe Flash. That could ultimately be a benefit to Silverlight’s future. However, it could simply be the case that Microsoft’s previous lack of investment in the IE team made SVG a low priority. After all, it was more important to fix IE’s rendering bugs first. Whatever the reasons, let’s hope Microsoft implement a full standards-based SVG rendering engine in Internet Explorer 9.0 or sooner. Coming tomorrow — 9 Reasons Why SVGs are Important for the Web.